Editor’s Note: This is the second in a series of stories on how climate change is expected to affect the Great Lakes region. Read part one. Some Michiganders smirked when a Popular Science video suggested the state would be a good place to live in 2100 to escape the consequences of climate change. As if it isn’t already! But the magazine’s broader point was climate change. Between oceans flooding coasts, wildfires torching the west, mosquitoes spreading disease and nasty storms leveling cities, the continental U.S. will be in rough shape by 2100. But Michigan and northern Wisconsin and Minnesota are going to be relatively unburdened by climate change. Or so the magazine says. A little warmer, sure, but not on fire or underwater, unlike those other places. “Let’s all move to Sault Ste. Marie!” the magazine joked in a graphic. 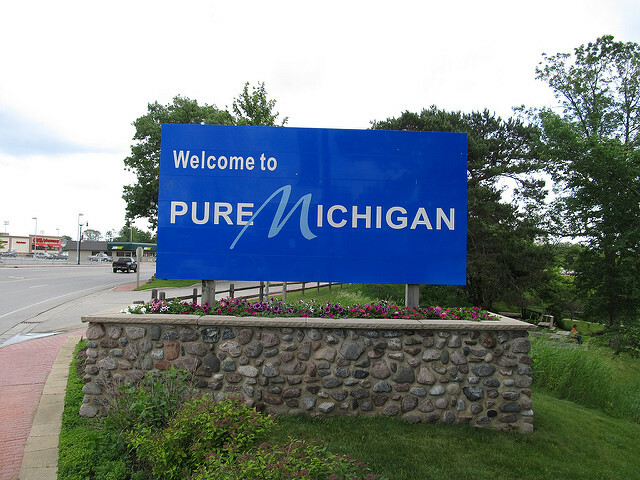 It’s true Michigan is a little safer from the big bad climate change problems people know about. Even if the Mitten is relatively safe, does that mean the whole country’s just a generation or two away from moving there? Experts are skeptical. None we talked to were aware of plans to brace the state for an influx of new residents. “I like living here,” Andresen said. Take Popular Science with a grain of salt. Which isn’t to say that human migration due to climate change won’t be a problem. It could be a big one, Andresen said. If nothing is done to make it easier for people to cope with the effects of climate change, more people will move, Cecilia Tacoli, a principal researcher of human settlements at the International Institute for Environment and Development, wrote in an email. So, while it’s pretty likely people will move somewhere, it’s not certain that they’re coming to Michigan. “We don’t really focus on the population change part of it,” said Aaron Ferguson, program manager at the Michigan Climate and Health Adaptation Program, which is under the state Department of Health and Human Services. The program works with communities to identify the things they need to do to cope with climate change – things like planting shade trees or making sure storm alert systems are reaching everybody. “Oftentimes climate change is going to exacerbate those existing issues,” Ferguson said. If a city is already too hot because of a lack of shade trees, that problem will be even worse when temperatures climb. People are already moving north, said Bill Currie, associate professor of natural resources at the University of Michigan. They tend to move to northern Michigan as they get richer. Will climate change, instead of brimming bank accounts, fuel the move in the future? “I’m not sure climate change is going to drive people north–that’s hard to say. It makes sense that temperature would drive moving,” Currie said. Or warmer weather and more rain could mean longer growing seasons for Michigan farmers, Currie said. That might mean fewer people. “If you think forward to 50 years in the future, if temps are higher and growing seasons are longer, you could have increased cropland,” he said. And that could actually mean fewer people since agricultural areas aren’t usually highly populated. Some people think the expanding growing seasons worldwide could mean some areas that don’t grow food now might do so in the future, Andresen said. But there’s more to it than just rain and temperature, he said. Watching the Popular Science video, you might notice that all of the “safe” places are in the northern U.S. Since the video only looked at the United States, is it possible that this isn’t a U.S. story, but rather a Canadian one? Not if you’re thinking about soil. “Soils take centuries to develop,” Andresen said. Climate change might warm up Ontario, but a longer growing season there doesn’t mean much if the ground is made up of the wrong stuff. “We can’t just move the corn belt into Ontario” because nothing grows in granite, Andresen said.